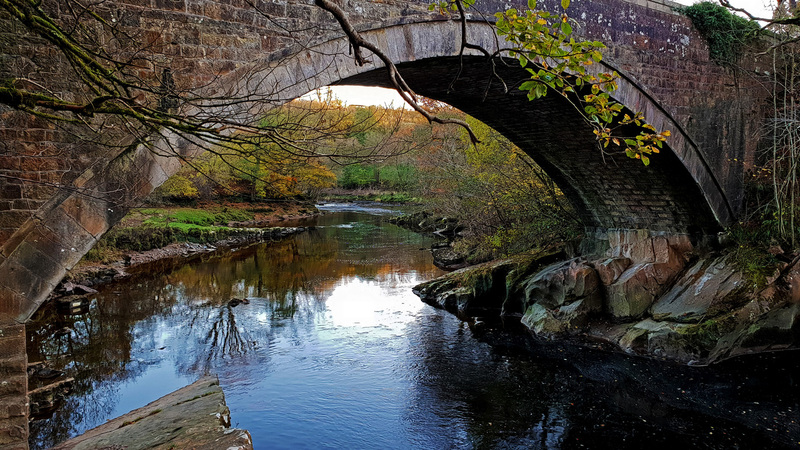 Pentonbridge sits on the very edge of the Scottish Borders about 20 minutes North of Carlisle. The inn, surrounded by 360 degrees of flat moorland is well off the beaten track and basically there`s a couple of houses and not a lot else. 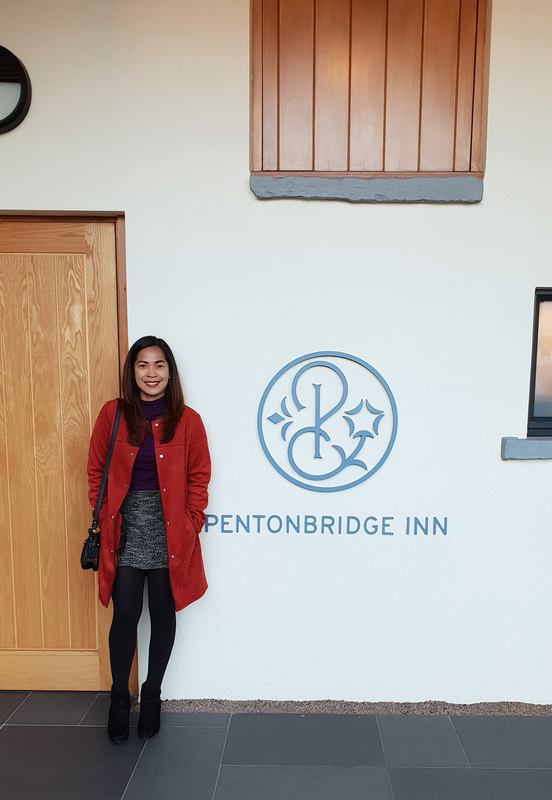 The closest town (Longtown) is several miles away and so The Pentonbridge inn is a super escape for the destination foodie to spend a cosy weekend. There`s a well stocked bar and really good food so what else would one need ? 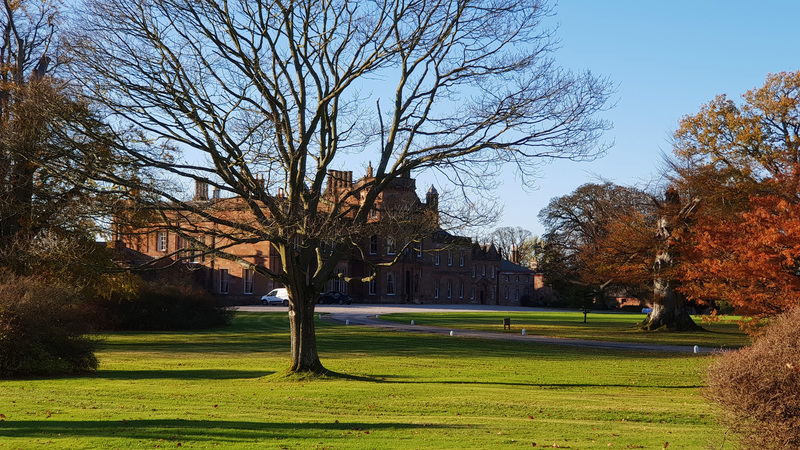 The owners of the business are Gerald and Margo Smith , both of whom live in the stunning 16th century Netherby hall just down the road. 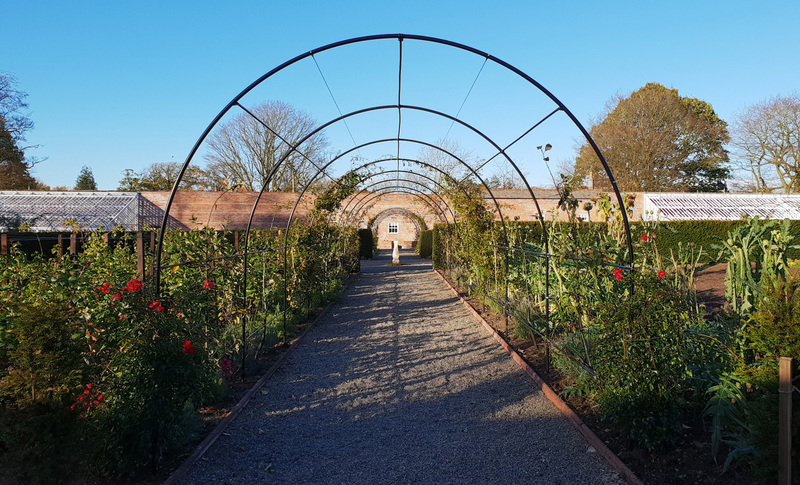 We stopped off en route to check out the Vegetable garden at Netherby , currently employing 4 full time gardeners and providing the business with 60% of the produce used in the kitchens. 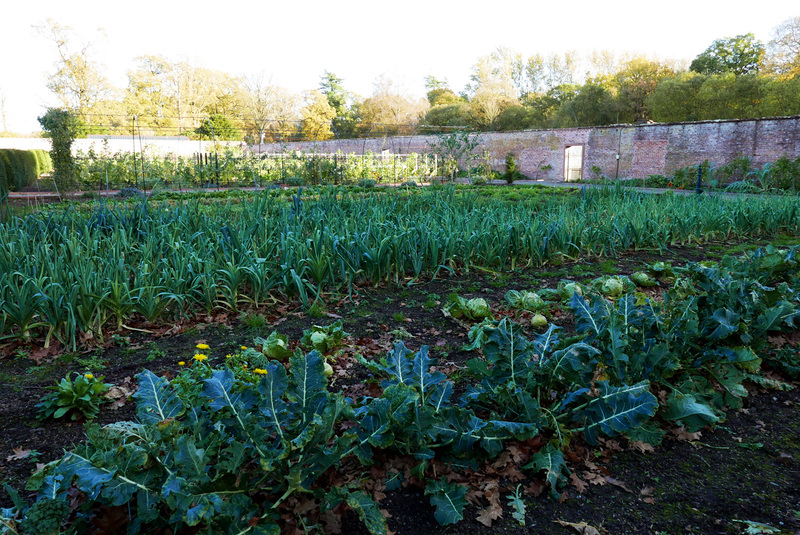 It was a cold Autumn day and the garden was suffering from the cold but still had lots of good produce on display. 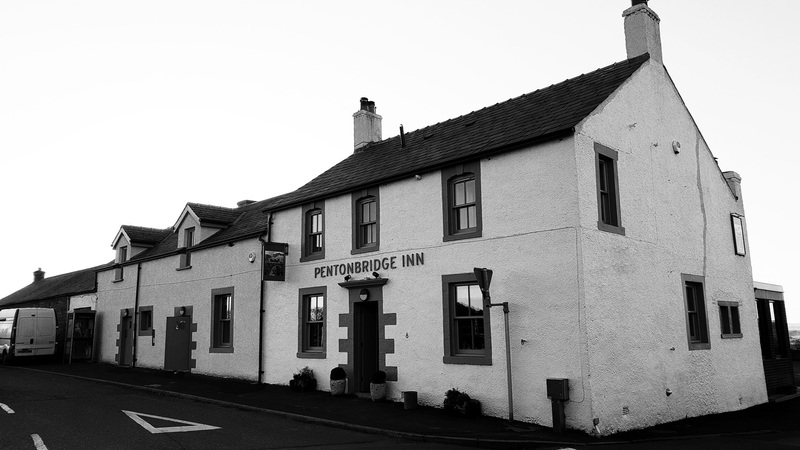 Pentonbridge Inn is a relatively new business , opening for the first time in late 2017. A small fortune has been spent on a full modernisation project bringing the property up to an extremely high standard. 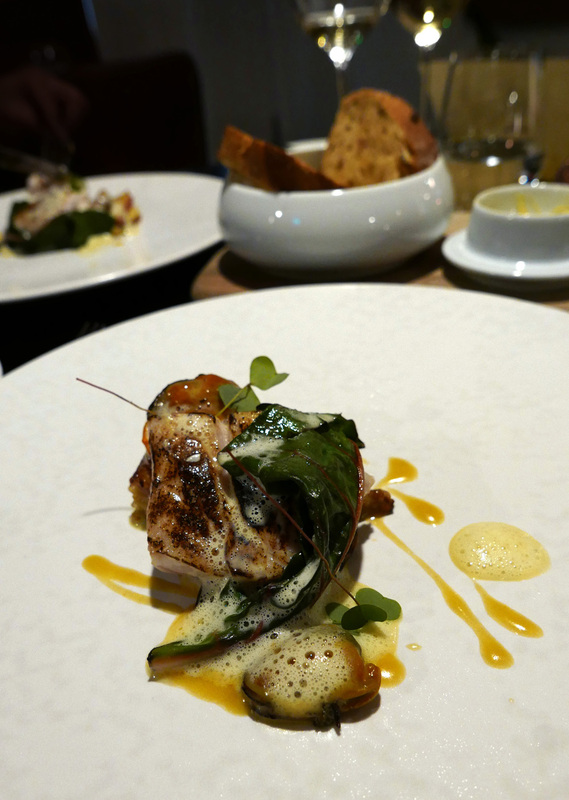 A good Sommelier , Chef and staff were all well sourced and Pentonbridge got off to a lovely start. We arrived a few hours early to check in and have a few well earned welcome tipples. 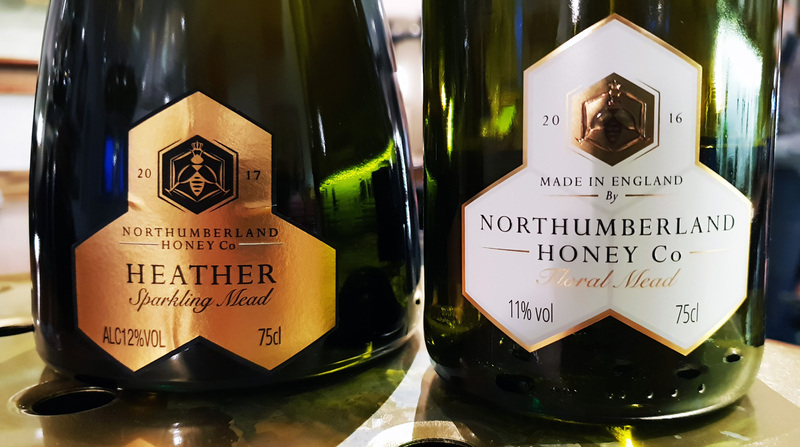 A tasting of Mead Wines was forced upon us and the lovely staff welcomed us with big smiles and lively chat. 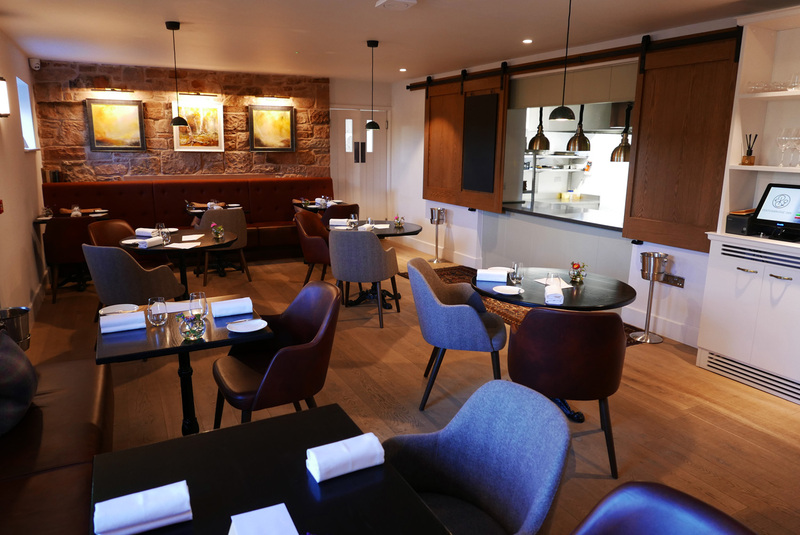 The Chef at Pentonbridge is Gary McDermott who took up his position in September 2018. He`s an extremely happy chap from the North east. Gary has a decent background with the likes of The Orangery at Rockliffe Hall and the Yorke Arms headlining his C.V. 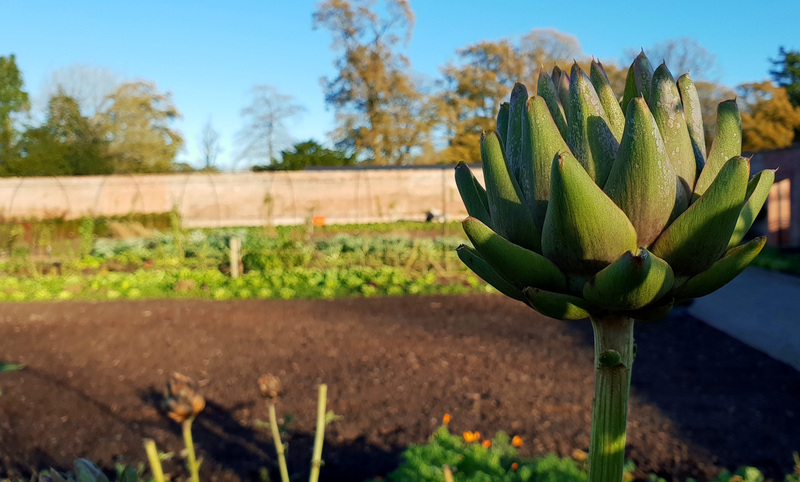 Chef changes the menu here every 6 weeks keeping in line with the output from Netherby hall gardens and whatever seasonal produce is available. 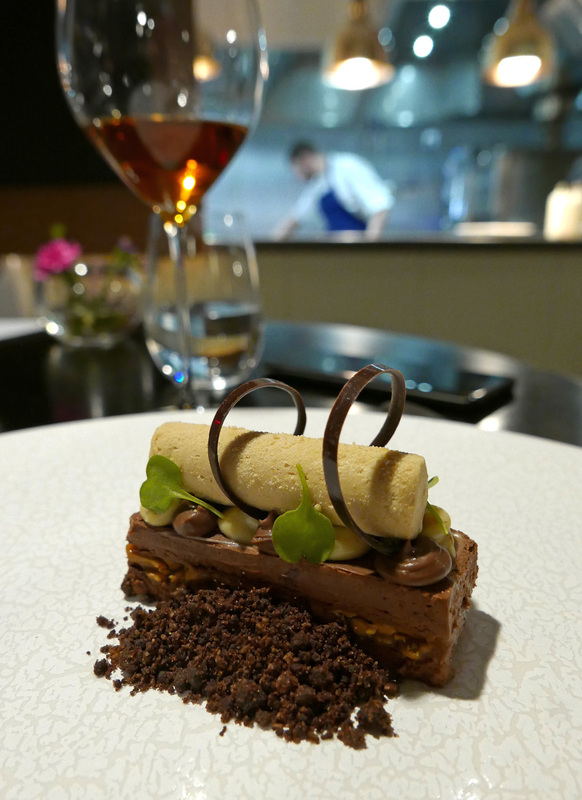 We chose the Tasting menu which was a very attractive £55 for 8 courses. 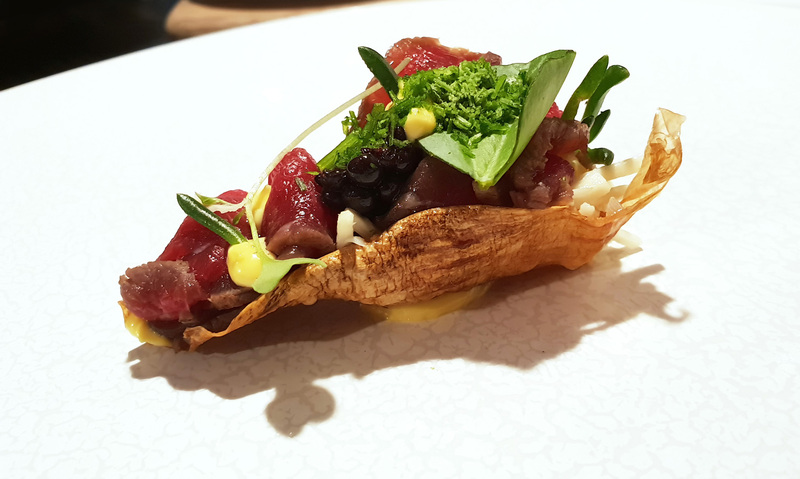 Ingredients were sourced locally where possible and some attempt had been made to incorporate foraged produce into the menu. At the time of our visit our room with Breakfast and Tasting menu for 2 guests was £199. Too good of an offer to turn down. I believe this offer will be extended to run until after Xmas. 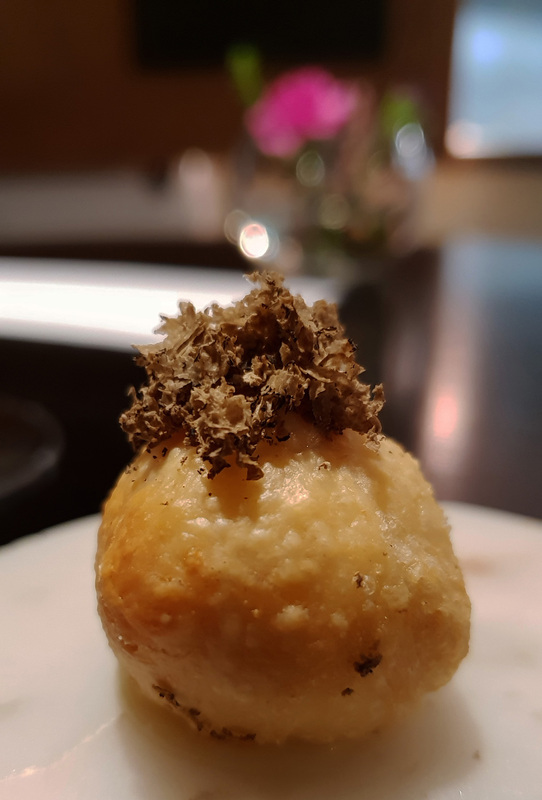 The Tasting Menu £55 – Started with some simple Amuse – Gougere with Truffle. 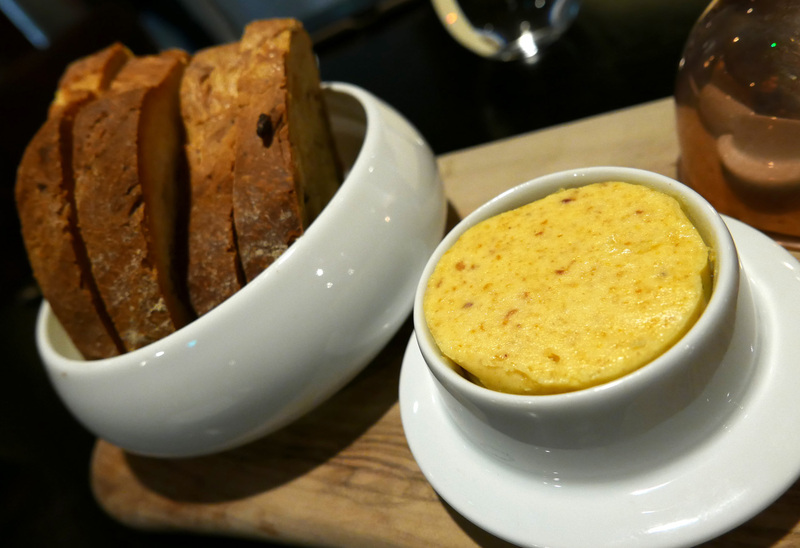 Chicken Skin Butter and house Bread – Butter like this should be available in the Shops , total flavour kick. 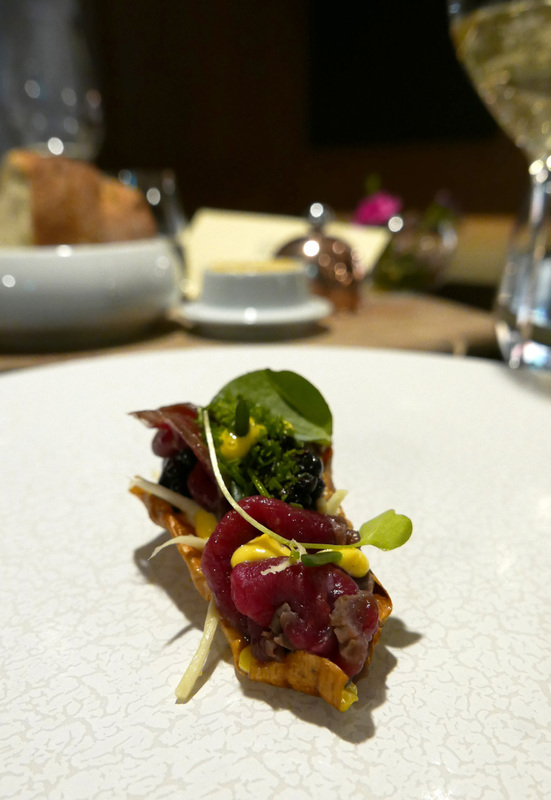 Venison – Venison Carpaccio , Parsnip , Blackberries , Truffle. 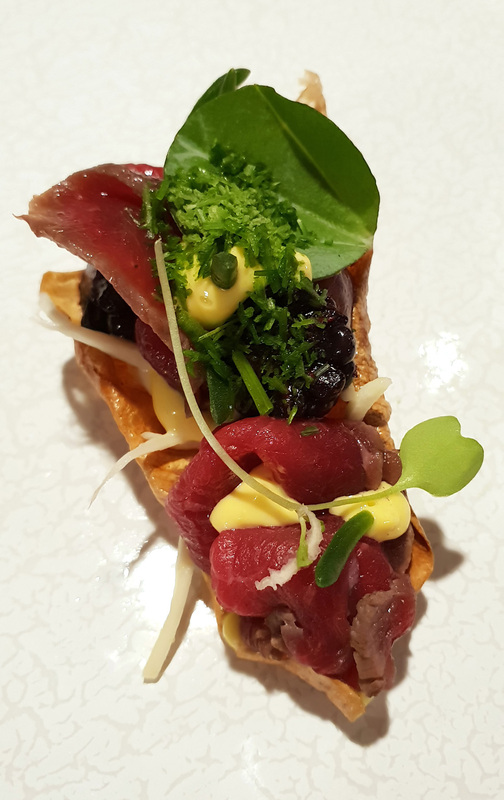 I love the flavour of root Vegetable Crisps so these sweet dehydrated Parsnips were a crunchy delight to carry their topping of rare Venison , Black truffle and tart berries. 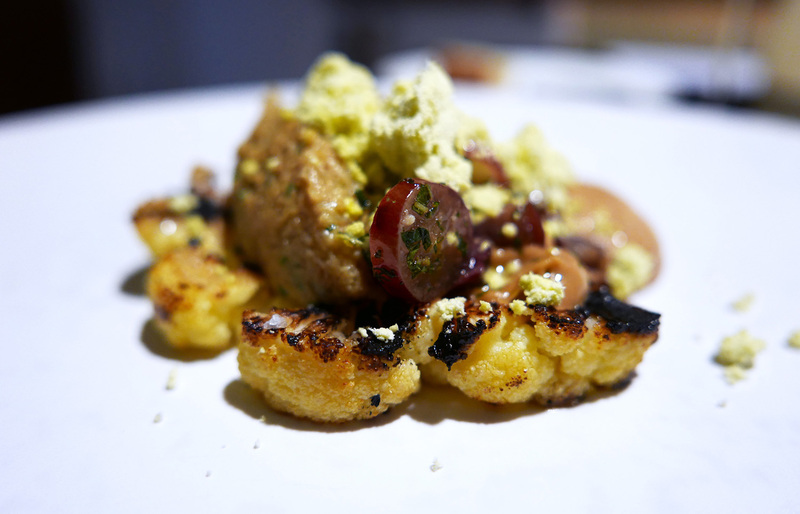 Cauliflower – Cauliflower , Grape , Capers , Mint. 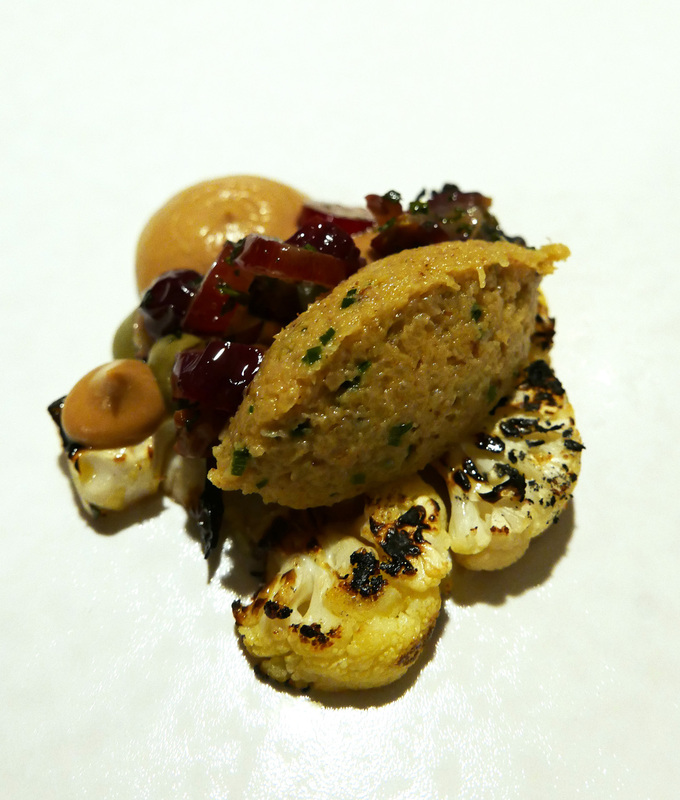 – Roasted / Caramelised Cauliflower is always in my all time favourite vegetables so I was really pleased to be served a course using this as a main ingredient. 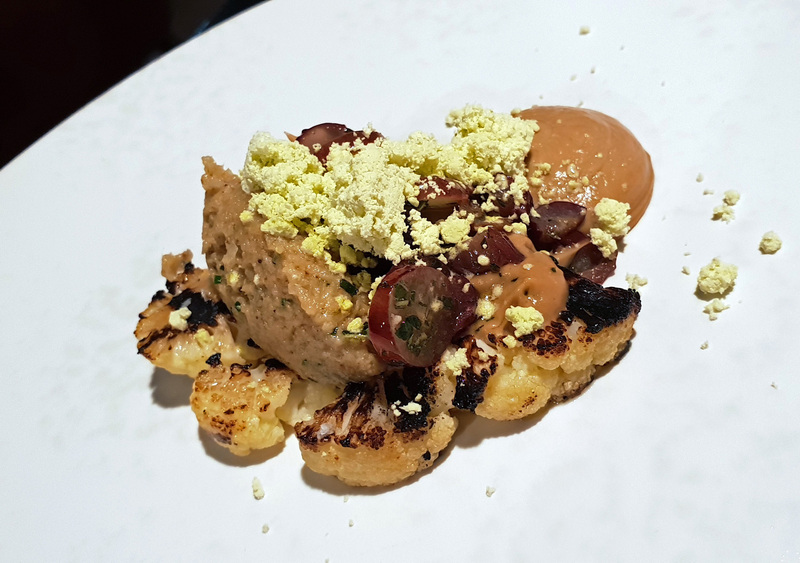 I wasn`t too sure about the Mint powder and Cauli combination but the flavour was very subtle and only served to complement the overall dish well. So we had BBQ , Sweet , acid , aromatic flavours on the plate which together resulted in a very successful dish. 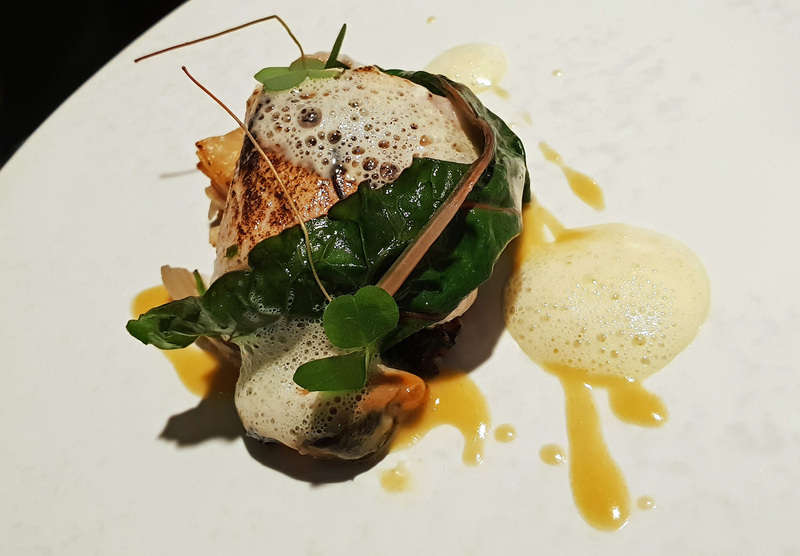 Bass – Stone Bass , Celeriac , Sorrel , Smoked Mussels. – Everything was well cooked and worked well together , a faultless dish. 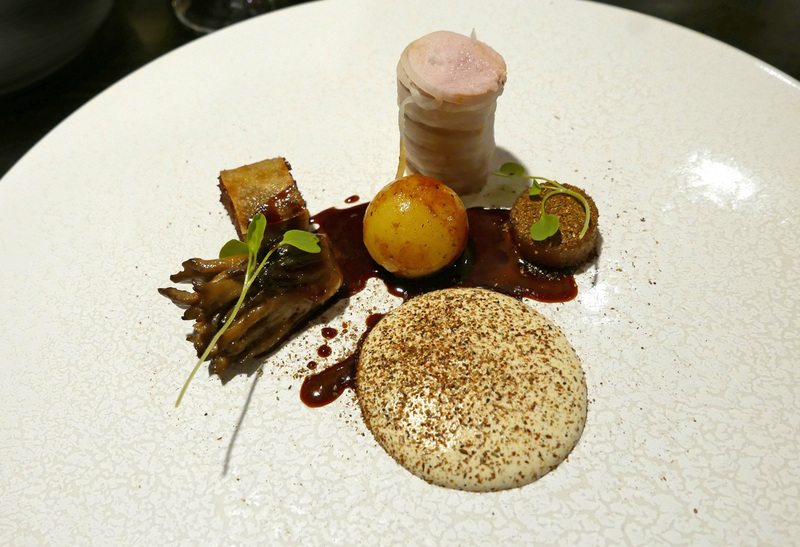 Guinea Fowl , Turnip , Hen of the Woods , Rosemary. OMG I needed more of this one. The portion size was too small for the delightful taste experience…. 1….2…..3….4 bites and then it was history and I was left in a state of sadness and desire for more. I remember this exact concept being behind the philosophy of the Tasting menus of Thomas Keller at the French Laundry and Per Se. 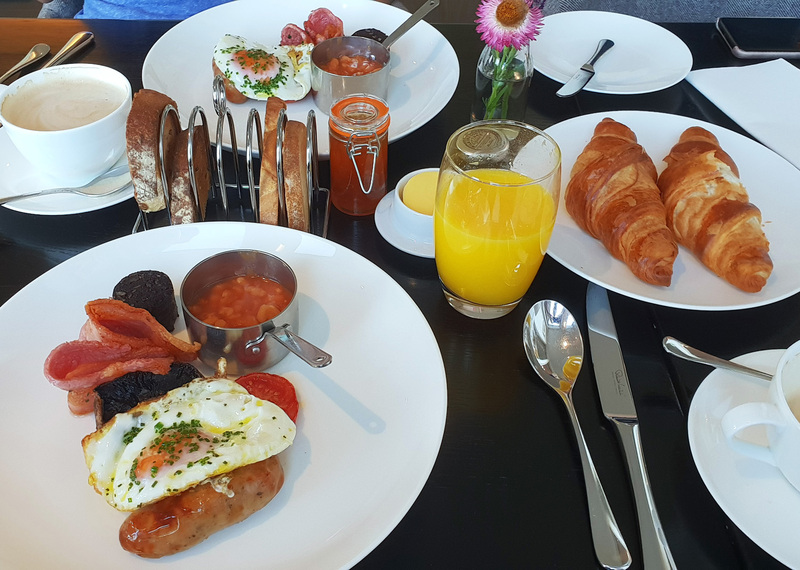 The customer begins to eat the food , the taste sensation explodes on the palate and then in a flash it`s all suddenly over leaving the diner craving more. Just before the frustration sets in , the next course arrives and the magic begins again….and so on. 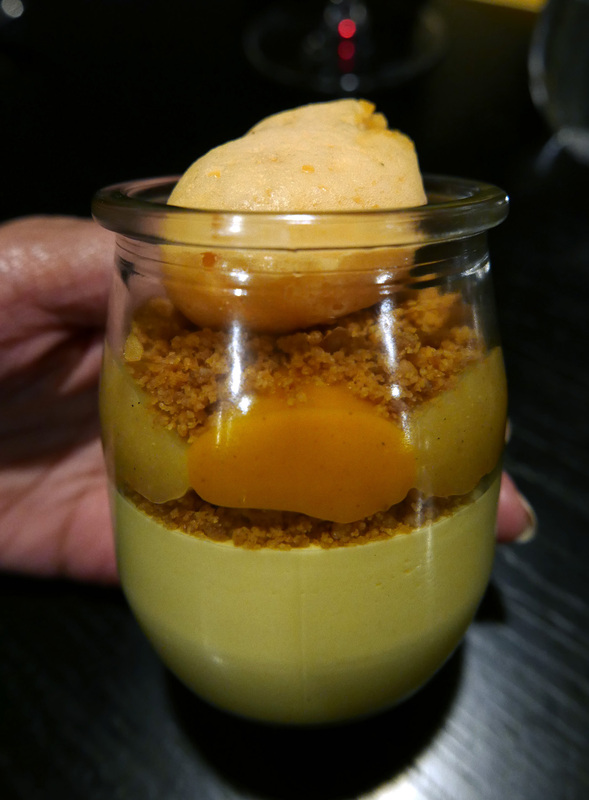 Passionfruit – Passionfruit Mousse , Brillat Savarin , Carrot , Golden Raisin. A little titillation pot containing a tart Passionfruit Mousse , a creamy Cheese topping and blobs of Carrot and passionfruit to finish. 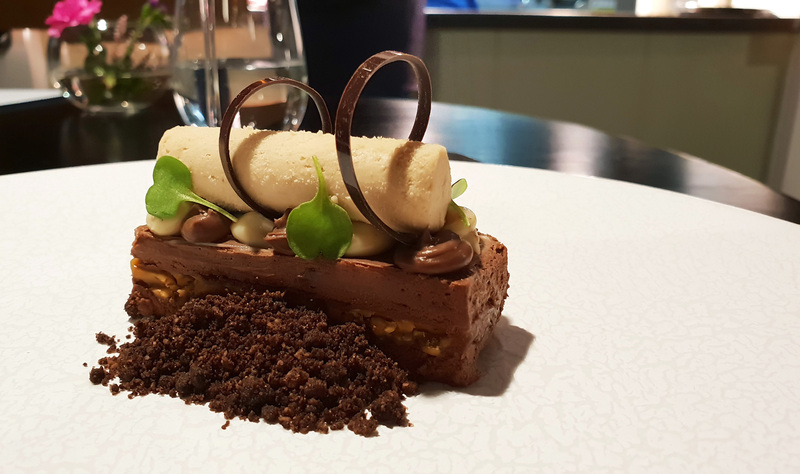 Chocolate – Chocolate , Dulcey , Tonka Beans , Caramel – Faultless offering from the Pastry section , perfect dessert. 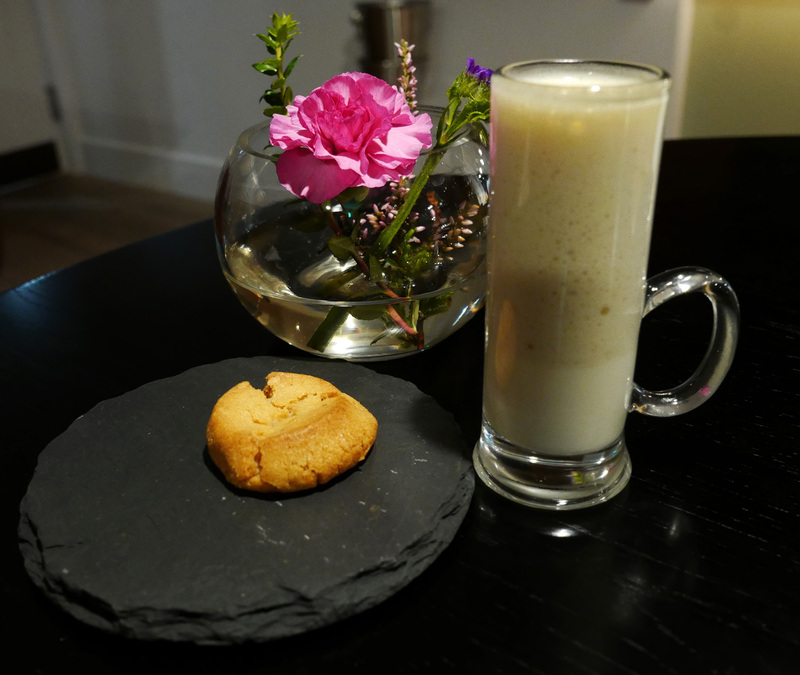 Banana Honey Milk Shake and a Cookie before Bed. 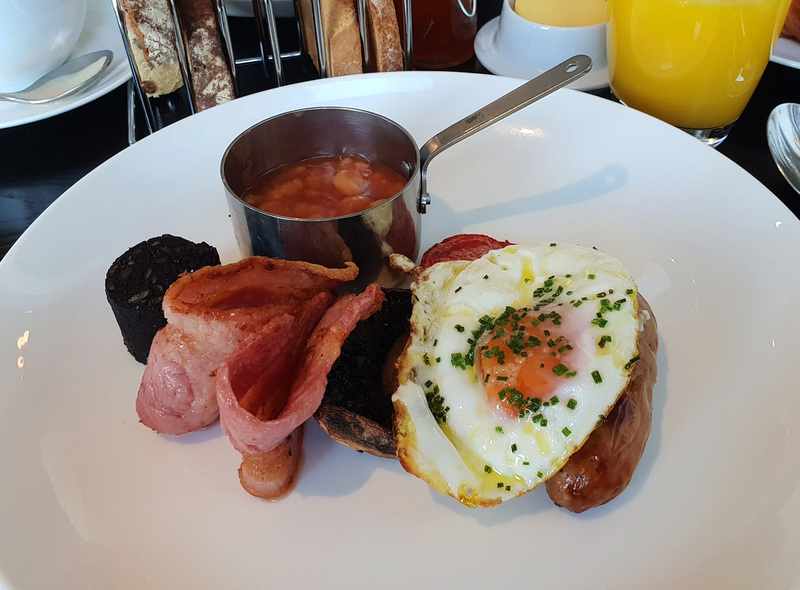 Currently the Pentonbridge inn is offering a Bed , Breakfast and Tasting menu deal at £199 …..For 2 guests. Food – I`m getting really picky in my old age middle years and always manage to find something to whinge about in most places that I eat in. I found the food at Pentonbridge to be totally faultless in every way , I really couldn`t find a thing out of place. Things can only get better once the team gets into 2019. Chef has only been cooking there for a couple of months so exciting times lay ahead. 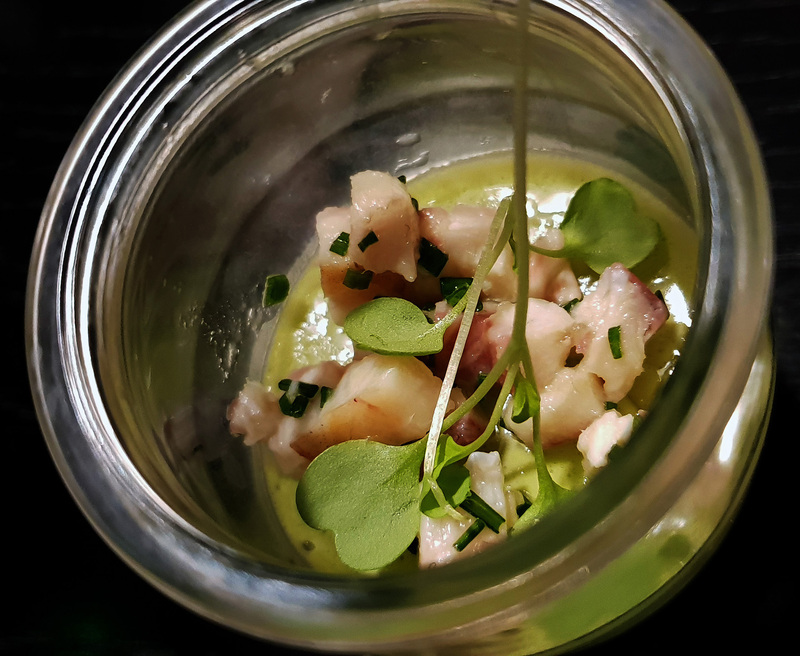 They have the menu basics off to a tee so now all I can recommend is to continue to concentrate on using the best quality fresh ingredients sourced from the local area , paying attention to detail on each course and keeping the prices attractive to put bums on seats. I`ll definitely be back again for more. Drinks – Great Wine flight to accompany the food. The Sommelier was a character , well informed and friendly. An example to the industry. Service – Friendly but customer interaction would be a big plus. I`m sure this will improve as the business develops. Previous Post The Ritz , London – High end delights. Next Post Tom Yam – Cooking Thailands national Soup. The food looks so delicious. Thanks for sharing it.